Staff and students of the School were shocked and saddened to learn of the death of their colleague and friend Claudia Comberti in a road accident on 9 May. As a testament to Claudia's life-force and passion, and at the request of her family, the School has set up a special fund in Claudia's name and memory. The Environmental Change Institute will also name their 2017-18 MSc Scholarship in her honour. She will be greatly missed. Filmed as part of the Intrepid Explorers event, June 2016 [654MB]. Claudia is a DPhil candidate at the Environmental Change Institute, University of Oxford. Her research focuses on adaptation to climate change in Amazonian Indigenous communities, and the role of human-ecosystem interactions and biocultural diversity in supporting resilience and positive responses to environmental change. In completing this research, Claudia has conducted extensive anthropological and socio-ecological research with several Indigenous communities of the Bolivian and Peruvian Amazon, particularly Brazil nut harvesting communities of the Tacana II group and communities in the Llanos de Moxos region of Bolivia. 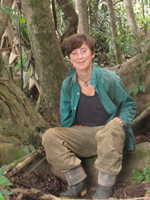 Previously, Claudia has worked for two environmental think-tanks: Global Canopy Programme (Oxford) as Forests and Wellbeing Researcher, where she worked on the Amazonia Security Agenda and the Community-based Forest Monitoring projects; and at Climate Strategies (Cambridge/London), supporting work on several publications including the book Planetary Economics (2013, Routeledge). Claudia completed an MSc in Environmental Change and Management at the School of Geography and the Environment, Oxford University (2012), and has a BA in Natural Sciences (Zoology) from Cambridge University (2008). In addition to fieldwork for the DPhil, Claudia has carried out ecological, conservation and ethnographic fieldwork, and led workshops and focus groups, with Makushi peoples in central Guyana (2013), North-West Nepal (2012, Oxford University), and the Madre de Dios region of the Bolivian Amazon (2009, with the Amazon Conservation Association), the latter of which inspired her current interest and research in Amazonian Indigenous communities and environmental change. When not studying, Claudia enjoys running, wild swimming, yoga, climbing trees and mountains, and other adventures. Claudia's research focuses on adaptation to climate change amongst Amazonian Indigenous communities, and how human interactions with ecosystems support adaptation and resilience to environmental change. Indigenous and local communities, often with livelihoods and cultural histories involving close relationships with the natural world, are amongst the first and most affected by environmental change. Also amongst the most adaptable human groups, and representing a significant proportion of the world's cultural diversity, Indigenous and local communities possess knowledge and innovations relevant to adapting to contemporary environmental pressures. However, relatively little is known about how these communities are being impacted and how they are choosing to respond. Particularly, many Amazonian communities, often living in relative isolation and forced to respond, are under-studied in this context. Claudia's research investigates the local-scale impacts of environmental change across Bolivian Amazonian social and ecological systems. It aims to highlight how positive adaptation amongst communities living within and dependant on the Amazon ecosystem can be best supported. Research has taken place with several communities from the Tacana II, TIM and TIMI Native Peoples Lands, in the Madre de Dios and Llanos de Moxos regions of the Bolivian Amazon. Research has focused on perceptions and impacts of, and responses to, recent extreme climate events such as droughts and floods; and to changing rainfall and temperature patterns. Through participant observation, interviews, focus groups and participatory workshops, the research examines the roles of specific species or resources, and of diversity both biological and cultural, in supporting adaptation to a rapidly changing climate. Claudia has also conducted research into the role of historical landscape modifications in current-day climate change adaptation, using the ancient earthworks in the Llanos de Moxos region of the Bolivian Amazon and the current-day communities as a case study. This builds on the research programme of Historical Ecology, linking it to current theories and understandings of adaptation and development. Claudia has worked as Teaching Assistant for the MSc in Environmental Change and Management for the 2015-16 and 2016-17 academic years. Lang, T., Sato, M., Grubb, M. and Comberti, C. (2014) The effects and side-effects of the EU emissions trading scheme. Climate Change. Thornton, T.F. and Comberti, C. (2013) Synergies and trade-offs between adaptation, mitigation and development. Climatic Change, 5(4): 509-519. Grubb, M., Laing, T., Sato, M. and Comberti, C. (2012) Analyses of the effectiveness of trading in EU-ETS. Climate Strategies, Feb 2012.